I’ve just realized that there have been quite a few recipes and photos which I’ve posted for those who follow me on Twitter and Facebook which my other readers who are not connected with me on those platforms have never seen. These don’t even include the recipes which I’ve developed for my weekly column on Serious Eats. So since I’ll be traveling overseas for the next several weeks, I thought, for the next couple of weeks, I would post some of the things some of you have missed on here. But, if you feel like it, while I’m somewhat absent from my blog (I’ll be posting short recipes every few days, but I won’t be writing much), you can follow me on Twitter, Facebook, and read My Thai Cooking column on Serious Eats. In the meantime, here’s a recipe for one of the dishes I’ve been making for several years. It’s good, though not Thai by any means. Put the butter and garlic in a large pot over medium heat. Once the butter has melted and add the shrimp and white wine. Close the lid and shake the pot to and fro over the stove as if you’re making popcorn. After a couple of minutes, check to see if the shrimp has turned opaque. If so, stir the pepper pieces into the shrimp and turn off the heat. Tear up the basil leaves by hand and throw those in as well. Squeeze the lime into the shrimp pot and give the whole thing one last stir. 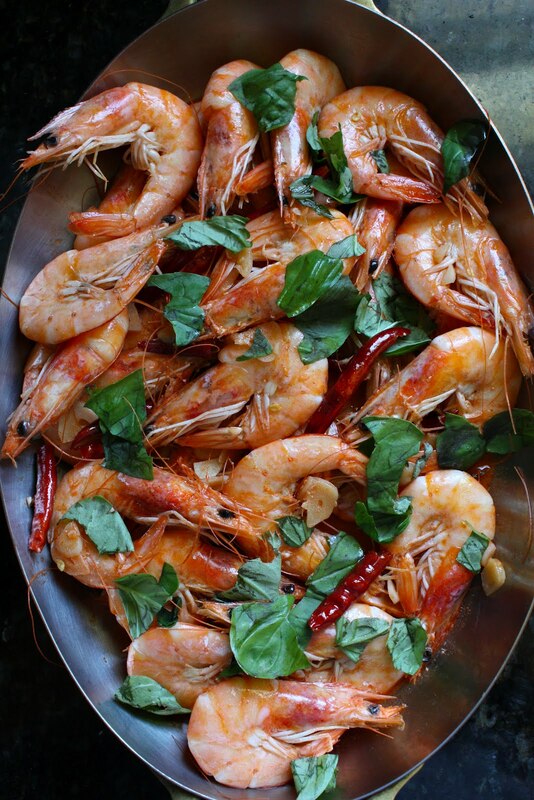 Serve the shrimp immediately with rice or bread to sop up the delicious juice. This is best eaten with your hands. Have always been following your blog, but onlyr ecently folloed you on twitter, so am looking forward to seeing the rest of these exclusive recipes hah. This looks like a winner, simple, fresh and lettign the natural sweetness of the ingredients shine for themselves! Shrimp with their heads still on?? You make me laugh! I’ll be sacrificing flavor and dealing with headless wonders! It’s all about where you live! This could be why I pack cooking gear on vacation! Love the recipe regardless!! Regular basil or thai basil? Thanks! Jenn – In theory, either one works. I prefer Italian basil for this particular dish, though. Hmmmm…The shrimp heads are definitely the best part of the dish! With such a simple recipe, I can hardly wait to give it a try. Thank you! Can I use shrimp without the head? No part of the content (digital photographs, recipes, articles, etc.) can be reproduced without written permission.